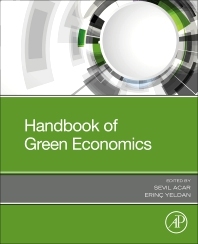 Handbook of Green Economics reveals the breadth and depth of advanced research on sustainability and growth, also identifying opportunities for future developments. Through its multidimensional examination, it demonstrates how overarching concepts, such as green growth, low carbon economy, circular economy and others work together. Some chapters reflect on different discourses on the green economy, including pro-growth perspectives and transformative approaches that entail de-growth. Others argue that green policies can spark economic innovation, particularly in developing and emerging market economies. Part literature summary, part analysis and part argument, this book shows how the right conditions can stimulate economic growth while achieving environmental sustainability. This book will be a valuable resource for graduate students and academic researchers whose focus is on the green economy. With an increasing interest in the topic among researchers and policymakers, users will find different theoretical perspectives and explore policy implications in this growing subject area. 2. How to handle natural capital within the context of the "green economy"? 8. Riders on the storm: How hard did Robert Gordon’s environmental headwind blow in the past?